Diagonal decking offers a different appearance to the deck and improves the strength of the deck by offering surface bracing in more directions. The process of building the frame and supports of the deck is identical to other decking projects. Installing the decking material requires some additional cutting, and may take a little longer than more conventional deck projects. Place a deck board at one corner of the deck. Position the board at the desired angle for the diagonal decking. 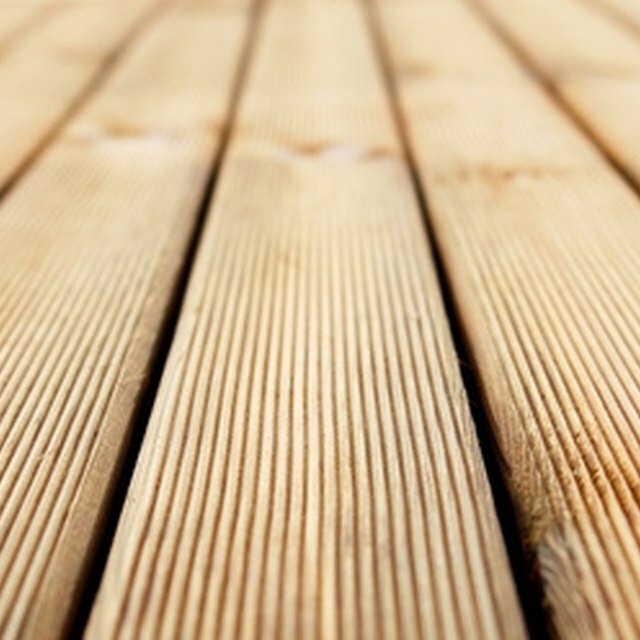 The ends of the decking boards extend over the edges of the deck frame. Attach the decking in place with two 2-inch galvanized deck screws into each deck frame or joist the decking rests on. Add additional decking boards to the deck. Space each board about a quarter inch from the previous board. Allow the boards to extend beyond the frame enough so the entire deck frame is covered. Continue adding boards across the deck in this manner. Find the point of the edge of the deck frame at each end of the deck. Stretch a chalk line between the points and raise the line before allowing it to snap back, leaving a mark along the line directly above the edge of the deck. Cut along the chalk line using a circular saw. The decking material beyond the framework is waste. Adjust the depth of the cut of the circular saw so the blade does not cut or mark the edge of the frame. Because of the waste material from the edges, diagonal decking commonly requires more decking material than decks with a more standard construction. Problems can occur when the deck separates from the building or the railing fails. While diagonal decking adds some strength to the deck surface, it doesn't strengthen the connection between the deck and the home or the railing.